This project involves wiring up an 8x8 LED Matrix to a WeMos Mini D1, and then serving a simple web-application from it. 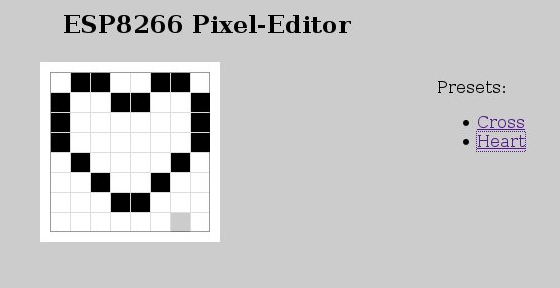 Point your browser at the IP address of the device and you can interactively use the pixel-editor application to update the display in real-time. There are a couple of default images wired in which you can setup too. Left-click to set a pixel, right-click to clear one. If you've previously configured WiFi details the device will connect automatically, and begin serving the application over HTTP. If you've never configured the device it will instead notice that, and configure itself as an access-point. This means you can use your mobile phone, or other WiFi-connected device, to connect to this access-point and choose the local access-point it should become a member of. 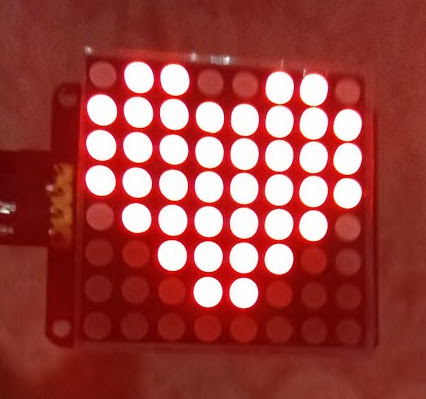 Respond to requests to update the LED matrix. These numbers are binary numbers representing which of the eight LEDs on each row should be turned on - so 128 is the left-most value, 1 is the right-most pixel in the given row, etc.